Mumbai, India (CNN) -- Countless bullet marks, a hole punched in a wall by a grenade and windows covered with plastic bear testimony to a carnage that left six people dead in Mumbai's Chabad House last year when terrorists besieged several sites around the financial hub of India. Among those slain in the coordinated strikes, which left 160 people dead and lasted four days, were young Rabbi Gavriel Noach Holtzberg and his pregnant wife who ran the Mumbai headquarters of the Chabad community --- an Hasidic Jewish movement. "This house was lively, full of happiness, full of friends," said Rabbi Avraham Berkowitz, who came from Russia to oversee Chabad in India after the attacks. "That is what we have to bring back." Once throbbing with Jewish visitors who were welcome to come to pray, eat kosher meals and celebrate religious holidays, the Jewish center, tucked away behind a causeway, is like a shrine. In keeping with Jewish tradition, the site has been in year-long mourning since the November 2008 attacks. Mumbai's Jewish community is close knit. They get together every Friday, now in a secret location out of safety concerns. Though attendance is down, there are newcomers who join to show their support, Berkowitz said. They are struggling to find answers, said Yehuda Krinsky, head of the Lubavitch World Headquarters, who is in Mumbai to mark the first anniversary of the 2008 strike with a remembrance ceremony at the Jewish center. "The question why, like a lightning bolt, keeps reverberating. There is no explanation," he said, visibly emotional. "You can compare it to the Holocaust, the gulags of the Soviet Russia, where Jewish people and many Chabad people suffered, were sent away never to be heard from again ... firing squads. In the homes, children in front of parents, parents in front of children, which was the case in this very building." The Holtzberg's child, Moshe, was orphaned in the terror raid. His nanny, who found him standing between the bodies of his slain parents, is now living in Israel with her and his grandparents. CNN International correspondent Mallika Kapur noticed little change at the Chabad House from a year earlier. Three weeks after the assault, she saw bullets everywhere, gunshots marks on walls, a blown-out ceiling, shattered windows, a blood-stained floor and a tie of the slain Rabbi Holtzberg. She found the same a year later, except for some cleaning up ahead of the first anniversary of the storming and prayers being read. The fate of the Chabad House is unclear. 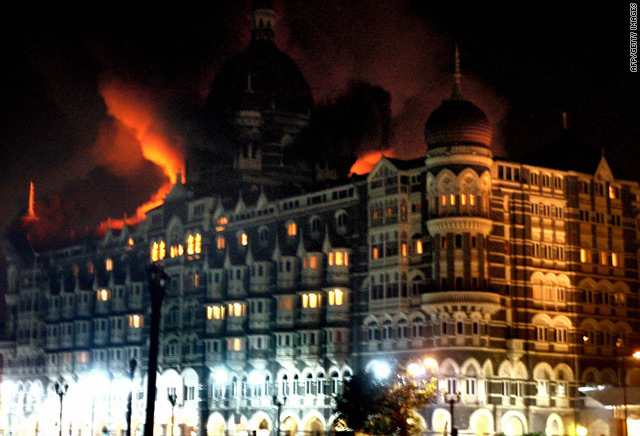 Since the deadly events, it has stood like a memorial to those killed -- unlike the other terror targets, such as The Taj Hotel and the Oberoi, which are buzzing again with business as usual. "We must learn from this (attack). We must make that strong commitment that this will not happen again. Not only that it won't happen again but to show it was in vain. You can't destroy lives in the manner it was destroyed in this building," Krinsky said.